Jim Murphy and Team WW2 made their second trip of the season to the famed Famoso drag strip with high hopes and lofty goals. A second round loss to eventual winner, Jack Harris dashed both. Nonetheless, the team was pleased with their #4 qualifying effort and first round win. Friday was slow paced and casual. 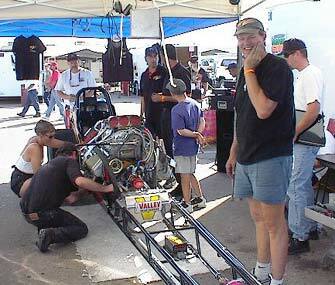 As the crew tinkers with the car, Jim Murphy enjoys a good laugh (or was just embarrassed). 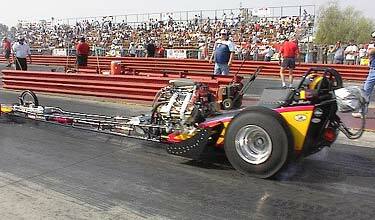 Unlike the high stakes, million dollar NHRA fuelers, the nostalgia Top Fuel cars are somewhat affordable and everybody has fun. 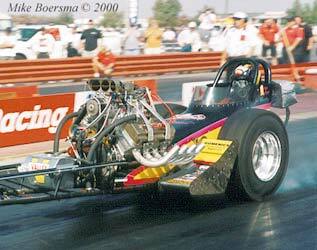 This first qualifying attempt was less than perfect as the car lifted the front wheels skyward and smoked the tires. Murphy heats up the tires prior to his 2nd qualifying attempt. Since the CHRR is more of a "happening" than a race, the fuelers only got two chances to qualify -- both on Saturday. Since the first run was less than acceptable, the team not only had to qualify here, but race Rance McDaniel for the #1 spot on the Nitronic Top Fuel List. The good news is they did qualify solidly, the bad news was Jim couldn't outrun the Champion Speed Shop car and remains #3 on "The List". 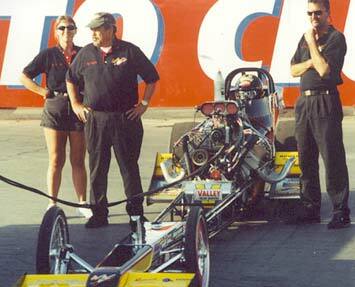 Team WW2 waits for the signal to fire the car for first round of Top Fuel on Sunday morning. Murphy defeated Lee Jennings in this frame. 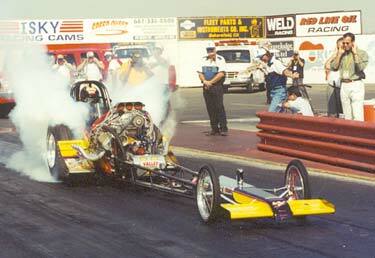 Murphy just starts his burnout prior to his round two race with the "Nitro Thunder" car of Jack Harris. 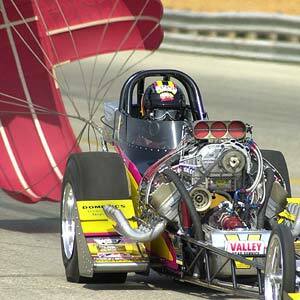 Harris got the lead at mid track and never gave it up beating the WW2 car with a strong 6.19 to a losing 6.34. 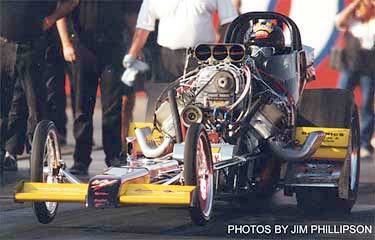 Both cars ran 226 mph. 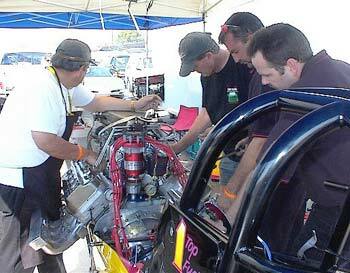 After their disappointing loss in round 2, the team found a fuel problem that caused the engine to run rich. As Murphy put it, "Yea we got something wrong with the old girl (she's real rich) the plugs look like they came out of the tow truck, but we'll get it back sooner or later." 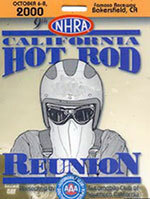 You can bet it will be sooner than later as the team prepares for the last race of the year October 28-29 in Las Vegas. It will not only be the last race, but Murphy's last chance to regain the Goodguys points he needs to repeat as Top Fuel World Champion.